Stemhead; stainless steel anchor roller. Windlass; located between the furling unit and the deck lockers, and over a dedicated chain lkr. Deck lockers; two side by side deck hatches give access to a rope locker on one side, and a gear locker on the other. The chain locker would be accessed through one or both of these. The aft partition of this pair of lockers is a partial bulkhead over the forward berth. This partial bulkhead will carry the tang and support for an inner forestay. Forward Guest Cabin (‘Layout A’); Large 6’ 8” long island berth, with drawers under, and seats on each side. A vanity counter is to port, with a hanging locker. A bureau is to starboard, with a larger hanging locker. Midship Guest Cabin (‘Layout A’); Features a Pullman berth, with storage under, and night stand type shelves on each side at the head. There is a combination bureau / hanging locker near centerline, and additional storage in a locker overhanging the foot of the berth. (Layout ‘B’ replaces the Pullman berth with over/under single berths). This version would give more easily accessible storage space and more floor area, and might be better suited to a family with younger kids). Forward Head; Includes a shower stall with a seat. Access is from the main cabin, so this head can serve well as a day head. Main Saloon; The main saloon sole is just below the waterline, one 6” step up from that of the living space forward of the mast, and two 6” steps up from the living space aft. There is about 30” of height between the sole and the hull skin, ample for tankage, batteries, etc. The main bulkhead just aft of the mast carries the chainplates directly. The mast is accessed below deck via a removable panel in the passageway. The main settee to port is 7 ft long bulkhead to bulkhead, and will seat five large adults very comfortably. A pair of stool seats can be fastened to the sole either for use in the passageway, or out of the way under the dining table, or at the smaller coffee table to starboard. There is a low boy end table forward of the shorter settee to starboard. Behind both settees are lockers and shelves under the side decks. Navigation Station; The nav table is located one 10” step up from the main saloon sole. This gives good sight lines when seated to the horizon, for both routine navigating and for inside ‘fly by wire’ helming by autopilot in rough weather. A deck hatch will give a view aloft for monitoring sail trim. Mechanical Space/Boat Locker; A doorway just inboard of the nav area opens into a large area left open for various mechanical options, and general boat storage. This space has a second doorway that opens into the engine room on centerline. Engine Room; The engine room is nearly 10ft long, including about 15” under the raised main saloon sole at the forward end. 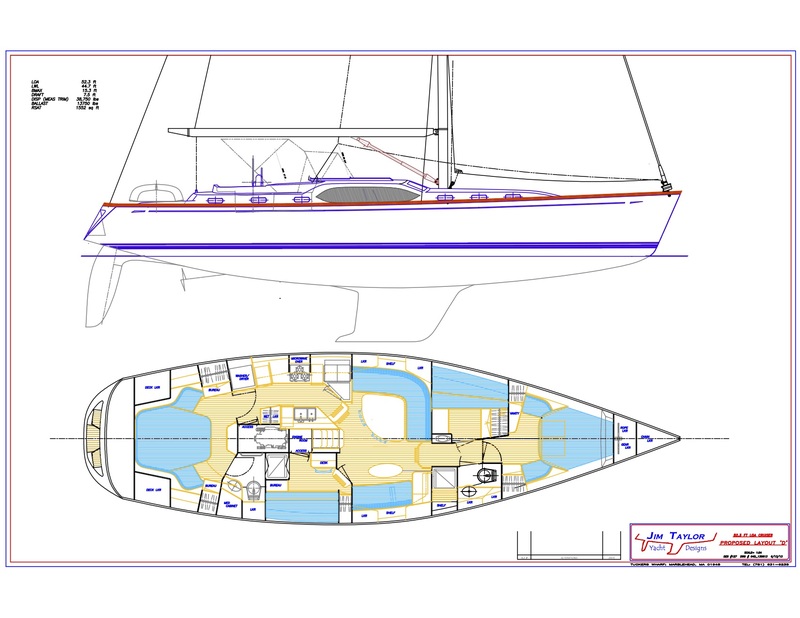 The space under the companionway is reserved for a 5.5kw genset. The main auxiliary is a turbo-charged 110 hp Yanmar 4JH3-TE-KM4A2. An AquaDrive CV joint is planned between the engine and the prop shaft. There is about 2ft of working space between the engine and genset, and there is access to the aft end of the engine and stuffing box through an additional access door just aft of the galley to port. Galley; The galley sole is two 6” steps down from that of the main saloon. Food can be easily passed from the galley to the dining table, as well as to the cockpit, either though a vent hatch or the companionway. A front opening section of the ice box is immediately outboard of the steps. A top opening portion, with a freezer, is further outboard. The sink counter overhangs a portion of the engine space inboard. A trash bin rolls out from under the counter just forward of the sink. There is dish storage over the sink, and pot storage between the sink and the wet locker. There are drawers and lockers either side of the stove, and space for a microwave over the stove. A Splendide combination washer/dryer unit is in a dedicated locker at the aft end of the galley passage, across from the wet locker and aft engine access door. There is storage space under the laundry unit. Master Stateroom; The aft cabin is dominated by a large island berth, that is 6’ 8” long, and nearly 6 ft wide at the shoulders. There is a lighted vanity counter on centerline, intended for use when sitting on the foot of the berth. There are seats, bureaus, and hanging lockers both port and starboard. There is a 6” step shown in the cabin sole. The lockers outboard of the head of the berth are for deck storage, and accessed form on deck. Aft Head; This private head is accessed from the aft cabin only, and features generous floor area, a separate shower stall with seat, and a large linen locker outboard. Deck Details; The overall styling is intended to be ‘contemporary classic’. The large windows in the main saloon are actually in two pieces, joined together at a center pillar. They would have some curvature. Teak decking would be anticipated for most boats. The headroom under the house forward and the main saloon is intended to be 6’ 6”. In the galley under the cockpit seats and coamings, it is drawn at about 6’ 3”. There are coamings around a ‘psuedo cockpit’ aft for swimming and sunbathing inshore, or chocking a ‘boom launched’ dinghy when passaging. There is storage for two LPG tanks just forward of the transom, which features a swim platform and steps.